Overnight stay at Bhandardara is a unique experience which you may have never experienced till now with monsoon sightseeing experience. Bhandardara is surrounded by the turquoise pristine water. Bhandardara is one of the best weekend getaways from Mumbai, Pune & Nasik. This place is always beautiful with its tranquil serenity and unspoiled nature. But during monsoon and post-monsoon period, its natural beauty increases many folds with numerous small & medium seasonal waterfalls and glowing greenery. During monsoon, it is difficult to arrange for camping in Bhandardara, but Visionesta Events provide accommodation in their guest house on a sharing basis in their dormitory rooms for large groups and also a few tent stays in shaded areas at the guest house. They have separate rooms for boys and girls and will provide you BBQ in the evening and also offer unlimited starters! It will surely be a memorable experience for you. Arrive at Bhandardara by 11:00 AM at morning in your own vehicle/other means. You can reach Igatpuri or Kasara and then take local transport (state transport bus or shared jeep) to reach Bhandardara. Having your own vehicle is highly advisable. 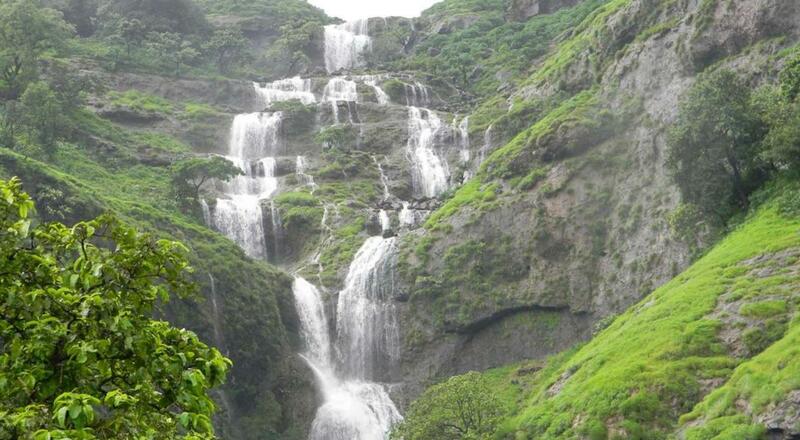 Enjoy afternoon lunch and get ready for the Bhandardara sightseeing experience. Sightseeing will be for a duration of 5 hours approximately, within a streach of 50 kms. After finishing the awesome sightseeing experience, you will be brought back to Bhandardara, evening snacks with tea will be given, relish the delicious BBQ along with scrumptious homemade dinner (veg/non-veg/Jain) will be served thereafter. Night stay at dormitory rooms or tents in shaded area to protect from rain. Wake up in the morning, after having breakfast, go for a walk at Bhandardara Dam, taking permission from the tour guide and under his supervision. After relaxing for some time, you can start your return journey to Mumbai or Pune and bid adieu to Bhandardara. 11:00 AM - After relaxing for some time, you can start your return journey to Mumbai or Pune and bid adieu to Bhandardara. Night stay in dormitory rooms/tents placed in shaded area. All expenses incurred due to unforeseen and unavoidable circumstances like road blocks, bad weather, etc. If the booking is cancelled 10 days or before the event date, then 50% of the booking amount will be refunded. If the booking is cancelled 5 days before the event date then no refunds will be given. Visionesta Events is not responsible for any baggage or personal belonging loss/damage and participants are responsible for the same.